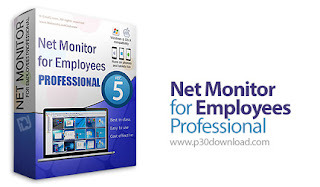 Net Monitor for Employees is an application that is designed to monitor and view the desktop of computers connected to the network. With this software, you can fully monitor and control your employees. In addition, you will be able to control the destination computer through the mouse and keyboard. As a result, you can observe the activity of each of your employees and, if necessary, use your mouse and keyboard to help them do things remotely. After installing the software, you will be prompted to enter a password to use it, so other people can not login to the software and use it. The interface of this software is very simple and easy. Also, you can even record the activities of the AVI file, even when you do not see the staff monitor screen, using this program. When your staff needs instructions, you can display them on the screen. You will be able to remotely perform various tasks, such as turning off or restarting your computer, starting or stopping the screensaver, locking out workstations, logging off users, and opening documents and web pages.